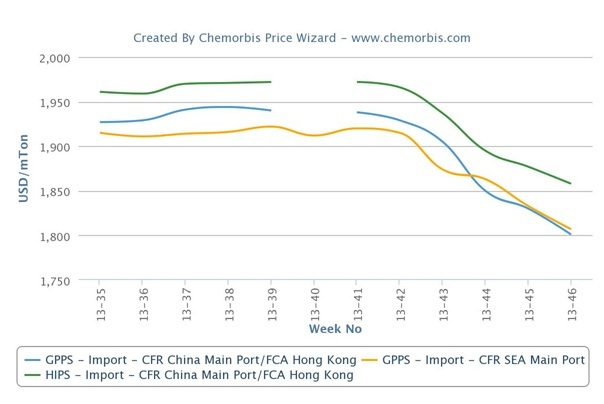 In Asia, import PS markets continued with their decreasing trend for another week and the overall ranges shed $10-30/ton in China while they lost $10-20/ton in Southeast Asia as per the pricing service of ChemOrbis. Import PS markets have been retreating since early October in the region while players voice no different expectancies on the price trend for over the near term. There are a few reasons behind these bearish expectancies but sluggish demand is pointed to as the main factor behind these drops since buyers resist higher offer levels amidst their weak end product demand. Apart from the thin buying interest, ongoing declines seen on Asian styrene costs coupled with lower oil prices, which remain below $95/bbl on the NYMEX, also played a role in softening PS markets. 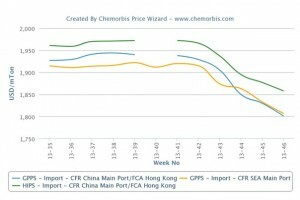 According to ChemOrbis, despite the bearish expectancies and lower PS prices, some sellers started to voice hopeful views based on the stabilizing styrene costs. 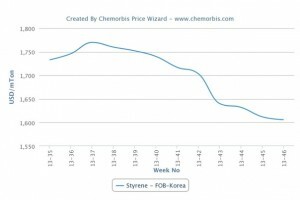 They remark that if styrene costs stabilize, they may stop large decreases from occurring on PS offers. 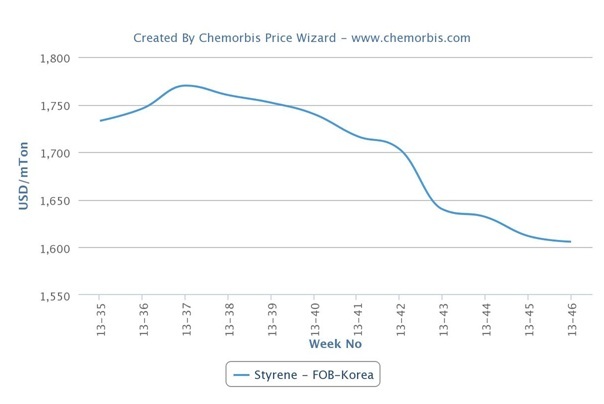 Spot styrene prices closed last week at $20/ton higher levels with respect to the previous week although they are still below late October levels.